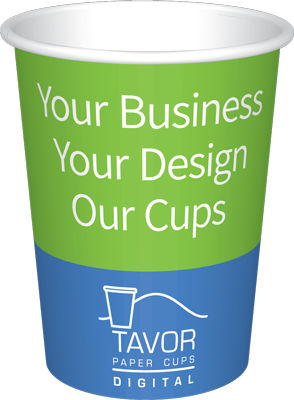 D.C. Paper and Plastic Industries manufactures TAVOR Printed Paper Cups for over 30 years. Our Digital Printing facility meets the strict production and quality standards of our factories that are ISO 9000 certified. The company’s factory is located in Afula, Israel and exports its products to happy Clients in countries around the world. Paper Cups Digital Printing technology is a the Perfect Solution for high quality printing for small quantity print runs at a very reasonable cost. Digital printing on disposable cups for Coffee and cold drinks saves the cost of the printing plates and setup – so you are actually only paying for the cost of the cups. With our technology every Coffee Shop & Buffet can brand themselves as a big chain! YES you can Brand Hot & Cold drinks Paper Cups with your company’s logo and design. Cups printed in digital printing allow you to brand any company and office event: Conferences, Exhibitions, Launches, Employee Events and ongoing use. The Digital Printing quality of printing is superior to Flexo and Offset, which we use for large print runs. With our Digital 300dpi print resolution your design will be more realistic than ever before. TAVOR Digital Cups Superior print quality makes it possible to produce beautifully branded paper cups without traditional printing restrictions – you’re welcome to challenge us with special designs because this technology is designed for this. Need a Quote and Fast? Our 30+ Years of experience makes your business paper cups branding easy, high quality & fast! D.C. Paper and Plastic Industries Ltd.
Part of D.C. Group, D.C. Paper and plastic Industries, manufactures and markets TAVOR Printed Paper Cups for 30+ years, for the use of: restaurants, fast food, coffee shops, ice cream shops and office use. The company’s factory is equipped with the most innovative equipment for the production and printing of paper cups for cold / hot drinks and ice cream cups in different sizes. The factory operates in accordance with strict ISO 9000 certified production and quality standards. The company’s factory is located in Afula, Israel and exports its products to dozens of countries around the world. © 1984 - TEXT DC Pack LTD - All Rights Reserved.